Riverwalk Resort features year-round heated swimming pools. LINCOLN, N.H. — This looming, sprawling, dazzling resort in the lively mountain town of Lincoln makes a bold statement. Set at the base of South Peak at Loon Mountain, it commands attention. There are peaks, and gables, and turrets. The exterior is painted the whitest of whites, the roof is bright cherry red. It looks a bit like its renowned neighbor to the north, the grand Omni Mount Washington Resort. 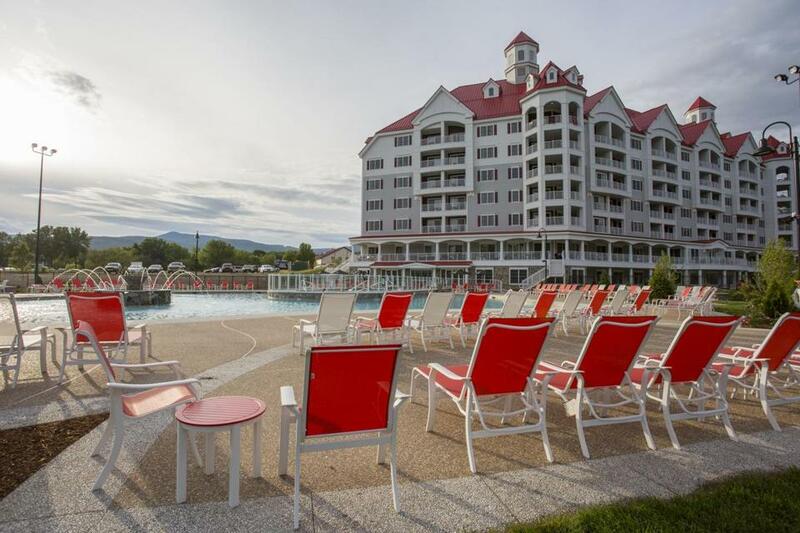 Of course, it’s not as storied or historically significant, but the opening of RiverWalk has brought a new level of luxury to the western White Mountains. “People call us the white castle,” said Renee Blood, the resort’s general manager. On cue, a horse-drawn sleigh pulled up, unloading a happy family of four. The property, built on the site of an abandoned paper mill bordering the Pemigewassett River, includes 138 units, from one room studios to three-bedroom suites, with town or mountain views. There are also two large, (2,004-square-foot) Presidential suites and two gigantic (2,324-square-feet) Penthouse suites. But no matter what you book, you’ll have plenty of space. Even studios are roomy and include small kitchenettes, and modern baths with glass enclosed showers. Suites have full, contemporary kitchens, large dining and living areas, electric fireplaces, master baths with soaker tubs, and private balconies. Guests can combine units to sleep up to 12 people. Decor is fairly traditional, but rooms are bright with neutral hues and creamy whites; stone and wood accents give a nod to the mountain-forest setting. Once you’ve settled in, the fun can begin. Book a treatment at the on-site Soltice North Day Spa, perhaps a pedicure or a couple’s massage. Enjoy s’mores around a campfire, or ice skating on the resort’s skating rink. There are heated year-round swimming pools and hot tubs overlooking the river and mountains, and a state-of-the-art fitness room. Movie nights, sleigh rides, barbecues, lawn games and special events are offered throughout the year, and a free shuttle takes guests to the Loon Mountain ski resort. The buzzy La Vista Italian Restaurant is getting top TripAdvisor ratings and local raves, serving updated Italian classics, like the lamb meatball fondue, lasagna bolognese, and chicken piccata, and wood-fired pizzas (try the caramelized pork belly and apples or the fig and sausage). Save time during your visit for a wine tasting at the on-site Seven Birches Winery. The small artisan winemaker uses grape varietals from around the world and locally sourced fruits to make some surprisingly delicious wines. Five samples are included in the tasting ($10). And if all this isn’t enough, wait. There’s more on the horizon. The resort plans to double its rooms, double the size of its winery, add a new convention center, and add a gondola that will cross the river, taking guests to the base of Loon Mountain, for true ski-in, ski-out access. Phase two planning is underway, and will make the white castle loom even larger. 22 South Mountain Drive, Lincoln, N.H., 603-745-7500; www.riverwalkresortatloon.com. Rates start at $179.